The 25 students from Rochester Prep High Schoolâ€™s first graduating class are bound for 16 different schools. 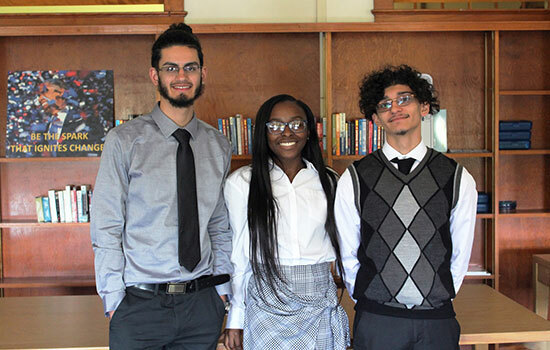 RIT and Uncommon Schools formed a partnership in 2013 to launch Rochester Prep High School with the goal of increasing the number of Rochester students who receive bachelorâ€™s degrees from college. 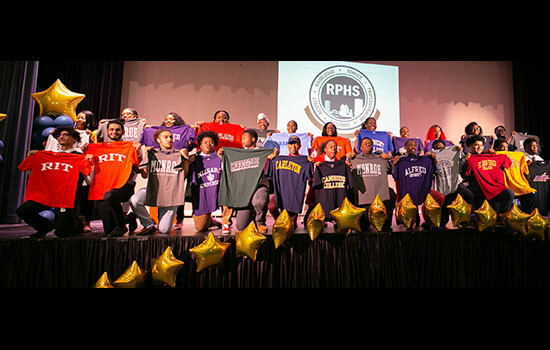 Rochester Institute of Technology’s partnership with Rochester Prep High School reached a major milestone today: all 25 of the graduating students from the first class at Rochester Prep High School are bound for college. Today the charter school’s initial group of seniors celebrated Decision Day, announcing where they will attend college in the fall in front of a crowded auditorium of family, friends and underclassmen. RIT has been a strategic partner with Rochester Prep High School since it launched in 2014 with the goal of increasing the number of city high school students who enroll in and succeed at college. Kit Mayberry, RIT vice president for strategic planning and special initiatives, said that RIT helped provide the students “a four-year orientation to all aspects of college life.” RIT students, faculty and staff helped prepare Rochester Prep students to succeed at college through coursework, tutoring and a unique senior capstone project program launched this fall. The students will be attending prestigious colleges and universities including Rochester Institute of Technology, Carleton College and George Washington University. RIT will welcome three students from Rochester Prep this fall—Zaid Abdulsalam (undeclared art), Ismael Cortes, Jr. (new media marketing) and Justice Marbury (photojournalism)—and more plan to transfer to RIT in two years after first taking classes at Monroe Community College. Abdlasalam was awarded a scholarship via the Destler/Johnson Rochester City Scholars Program. Longtime RIT Trustee Ronald L. Zarrella contributed the funding necessary to support the development and delivery of RIT’s contributions to the partnership.